SEO is one of the most primary digital marketing techniques that any brand intending to succeed should adopt. Technical on-page SEO focuses on optimizing the websites content, for relevant keywords and to improve user experience to visitors. It is a very relevant ranking factor in search results and optimizing its elements can boost your sites overall marketing performance. The meta title tag has the greatest impact in regards to your on-page SEO. It is the clickable 55 character element that searchers respond to in order to be directed to your page. The meta-description is very important as well, it tells searchers how relevant your site is to their inquiry. The content of the meta description is crucial, it has to be well written and informative enough to entice the searcher to click on your meta-title. Without an optimized meta-title and description, search engines would pull text from your main text, and most of the times, those words may not be enough to draw visitors to your site. We help you create descriptive and well-optimized meta-tags and meta-title content like a pro; with structured data to captivate searchers and boost click-through rates. Search engines rely on micro-data called schema markups to match website content to user searches. They use this micro-data to scan your subject matter and determine if it is applicable. It is easier for your site to be matched with user queries if the proper schema is integrated into your code. Considering that search engines cannot view images like humans do, they rely on image ALT tags to index pictures` and display corresponding illustrations to searcher queries. We create a highly descriptive image ALT tag embedded with relevant keywords in order for our clients to enable search engine crawlers to identify images on their websites. Many people overlook their website’s speed in regards to mobile devices. It is imperative that your website offer a user-friendly experience, regardless of their equipment. Traffic is driven by high speeds and quick loading pages. We optimize your website for mobile devices and improve the loading speed by creating responsive design, HTML and XML sitemaps, fix 404 errors, repairs 5xx HTTP status code links, and create 301 redirects to proper URLs. Our highly skilled experts also provide other technical on-page SEO services such as grammar checking and editing, consulting Google interactions, code fixing, on-page NAP consistency, enabling AMP/SSS, URL rewriting and restructuring where necessary. The goal is to make your site more accessible, user-friendly and interactive with visitors. There are two sides of SEO. One focuses on content and the other manages the technical side. Content: involves finding perfect keywords, deals primarily with proper structuring of your articles. It involves tactics, research, and planning. It structures your title tags so that they reflect the overall theme of your website. This requires you to write compelling meta descriptions that are designed so that users click on your page when it is displayed in search results. Website owners are often tasked with making sure that their H1, H2, and H3 subheadings are in proper order and that their images are described in such a way that search engines know how to categorize them. Most importantly, it requires you to offer content that is both unique and engaging, encouraging your reader to return time and time again. This is the type of SEO that drives results and promotes your business. Imagine your website like the floor plan of your house, filled with rooms, the same way an XML sitemap is the blueprint of your business. The best XML sitemaps make it easy for Google and other major search engines to quickly find each page. Rankings often hinge on how well these maps are laid out. Our job is to ensure that search engines have no problem discovering everything that you have to offer. Not only are 404 Error messages annoying to your visitors, they also send a notice to search engines that your website may not be reliable. It’s important to build a page that comes up whenever someone clicks on one of your broken links. This redirects them to a page that they can use in order to explore your website further. 404 redirects serve as a way to ensure that visitors continue to search your site for what they need. This discourages them from quickly leaving your website which can have a negative impact on how search engines view your business. We help ensure that these pages are well laid out and easy to navigate. Never lose a visitor to a broken link. No matter how diligent you are with technical on-page SEO, if you do not have enough experience you will inevitably make an error with coding. Unfortunately, these type of mistakes have the ability to throw off your entire website and cost a significant amount of time to repair. Our specialists can alleviate these issues for you and save you money and the stress that typically accompanies these errors. Duplicate content is when your written material can also be found on another website. While having multiple copies of the same content floating around the internet is not technically a penalty it can still have a negative effect on your search engine rankings. How can you ensure that your rankings do not suffer? You simply tell the search engines not to crawl that information. This service is accomplished by our skilled coding experts. From link building, content marketing, & web design, to the more in depth technical on-page SEO we have a solution for you. Our team is familiar with all of the ins and outs of full service SEO and we offer you the experience of a team of people focused on enhancing your web presence. 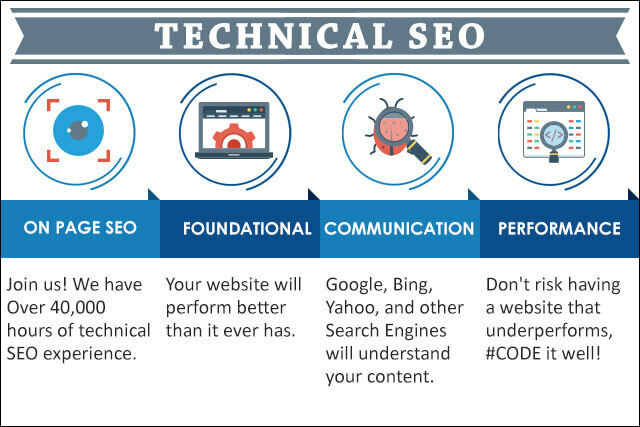 When done well technical on-page SEO can take your business to the next level. We’re ready to help you move forward and grow your success.